While this spring has shown us weather of every different variety, it appears that the majority of our upcoming days are going to be filled with sunshine and blue skies. Although the girls tend to find happiness outdoors with toys or without, it never hurts to have a few of the classics on hand to give their imaginations and creativity a push. Most recently, we've been able to celebrate our time outside with four new and entertaining products from our favorite trains, Chuggington. The addition of two Chuggington bubble toys from Little Kids, Inc. and two vinyl playballs from Hedstrom to our collection have given new life to our outdoor play. Are there kids that don't love bubbles and balls? If so, I haven't met them yet! 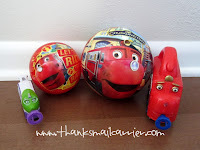 With no explanation needed, the girls were immediately playing with the Chuggington Vinyl Playballs and laughing over the bright colors and endless possibilities. ...while the "Let's Ride the Rails" Chuggington Vinyl Playball is slightly smaller in size and features a variety of bright Chuggington-themed images. The perfect addition to any playtime, both of these vinyl playballs are fun to roll, throw, kick and bounce for just about any outdoor game. Big Sister E and Little Sister B love that they are small enough to fit well in their hands and I appreciate the durable quality that ensures that both balls have held up to calm games as well as very active ones. 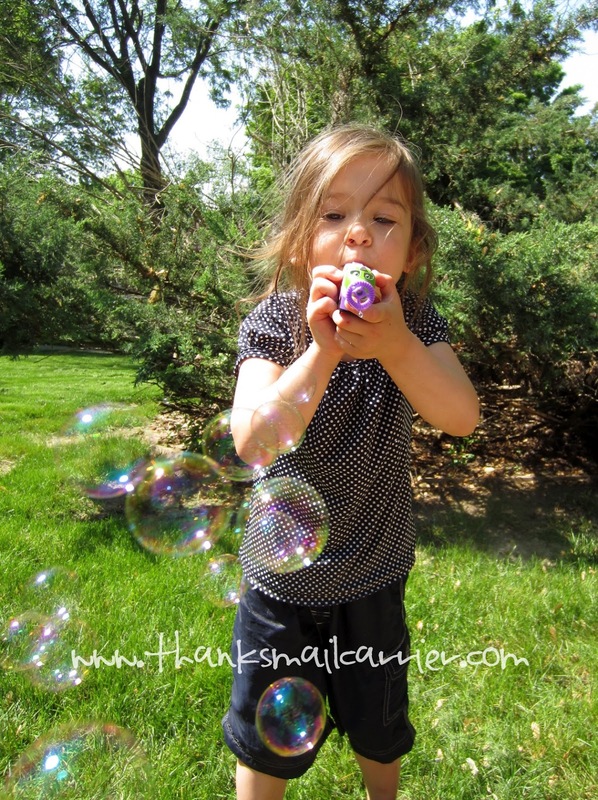 When it comes to bubble toys, I think that we have owned just about every type, size and style available. However, over the years we've come to realize that not all of them are created equal and those toys that don't work well, are difficult to use or just don't end up producing bubbles never get pulled out again. In the case of the Chuggington Bubble Train Whistle and the Chuggington Light Up Bubble Chugger, it was the exact opposite. These toys were nearly ready to use right out of the packaging and were sending bubbles soaring through the air within seconds! The Chuggington Bubble Train Whistle is available in Wilson, Brewster and Koko shaped whistles and is just about the easiest bubble toy we've owned. 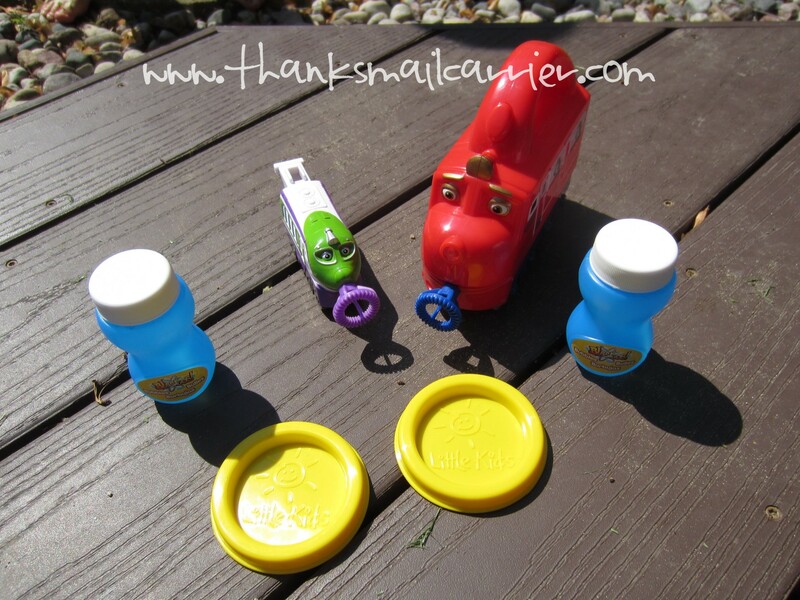 As it comes with a small dip tray, you simply pour a little of the included bubble solution (it comes with a 2 oz bottle) into the tray and allow your child to dip the front of the whistle right in. When they blow through the whistle, not only does it result in a real train whistle sound (which kids love), but a large amount of bubbles come streaming out! 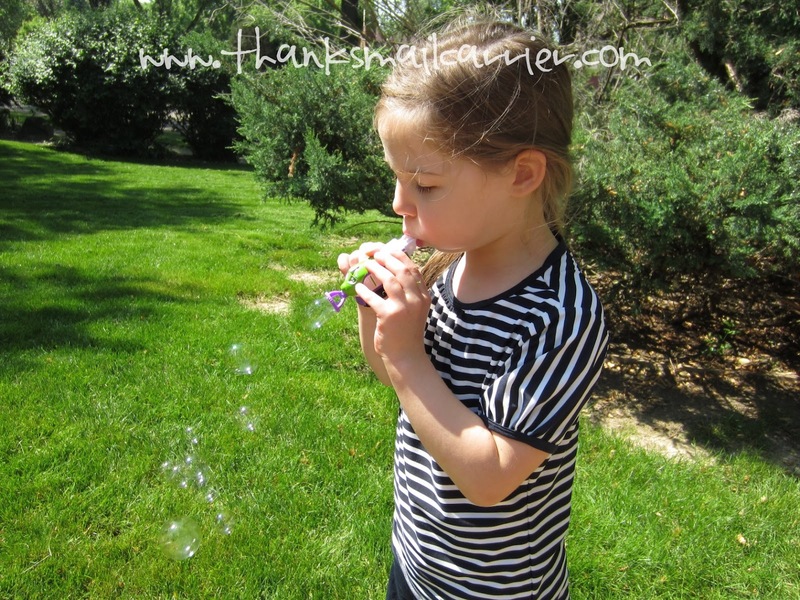 This Bubble Train Whistle really couldn't be any more simple to use and both of the girls have been thrilled with their ability to have it send out so many bubbles while sounding the horn. At the same time, they like that they don't have to deal with putting a traditional bubble wand back into a sticky jar of solution, as swirling the end of the whistle in the tray is no problem! For even easier bubbles, the Chuggington Light Up Bubble Chuggers (also available in Wilson, Brewster and Koko varieties) are made to fit well into little hands and operate with only the touch of a button. Once I had installed three AAA batteries (not included), the girls only had to swirl the end in bubble solution in its own dip tray and press on the button conveniently located on the front of the handle. The result is yet another long stream of bubbles that would make any child happy and provide a quick sense of accomplishment! 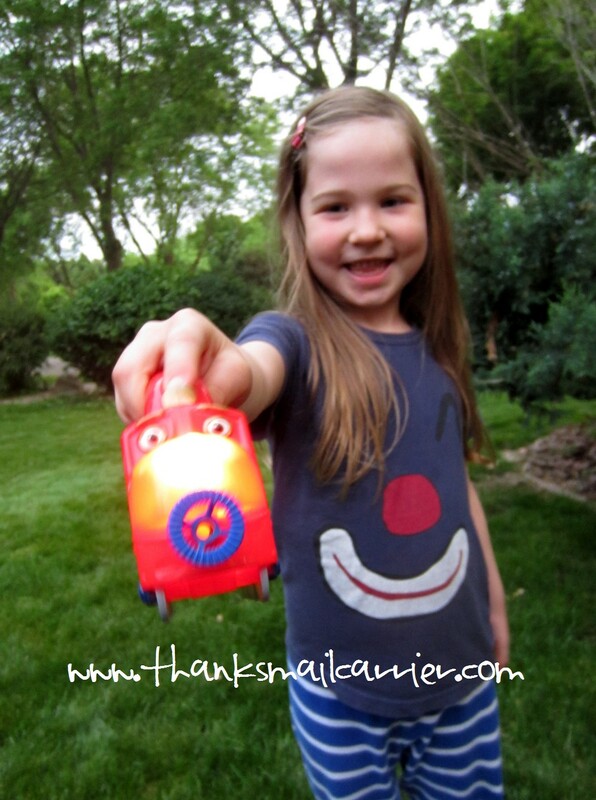 We've really enjoyed how lightweight this Light Up Bubble Chugger has been, making it easy for both girls to carry it near or far around the yard. As an added bonus, the included flashlight at the front gives this toy an ability to not only provide fun and entertainment in the afternoon, but as a special before-bedtime treat! With the long summer months ahead of us, I have no doubt that we will be reaching for all four of these Chuggington toys time and again, whether at home, to bring to the park and more. 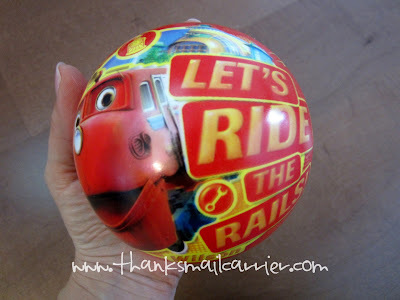 Even better, as they are all quite affordable (the Chuggington Vinyl Playball retails for $2.00, the "Let's Ride the Rails" Playball for $2.50, the Bubble Train Whistle for $4.99 and the Light Up Bubble Chugger for $8.99), it won't take much to purchase enough for all of the kids in your life to participate in the fun. The Chuggington Vinyl Playballs will be available in June 2012 at Kmart, Babies 'R Us, Target and Walgreens, while the Chuggington bubble toys are available now at LittleKidsInc.com and specialty retailers. If you have a trainee in your life that would enjoy being active outdoors with Chuggington, these items would make great gifts! But, wait! 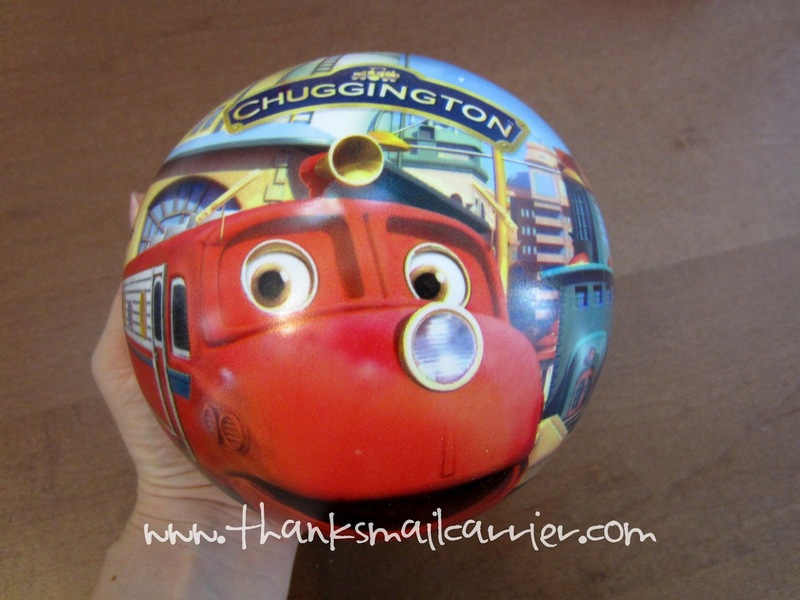 Chuggington not only wants kids to have fun outdoors, they care about their safety as well. As the Chuggington 'Think Safe, Ride Safe, Be Safe!' 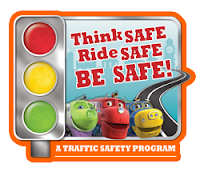 campaign aims to provide safety and transportation guidance to children and families across the nation, for the month of May they are celebrating National Bike Safety Month. Always wear your helmet and make sure to buckle your chin strap. Ride only with an adult. Don't ride in the street. And more! For more bicycle safety tips, be sure to head over to the 'Think Safe, Ride Safe, Be Safe!' campaign with your child this spring. 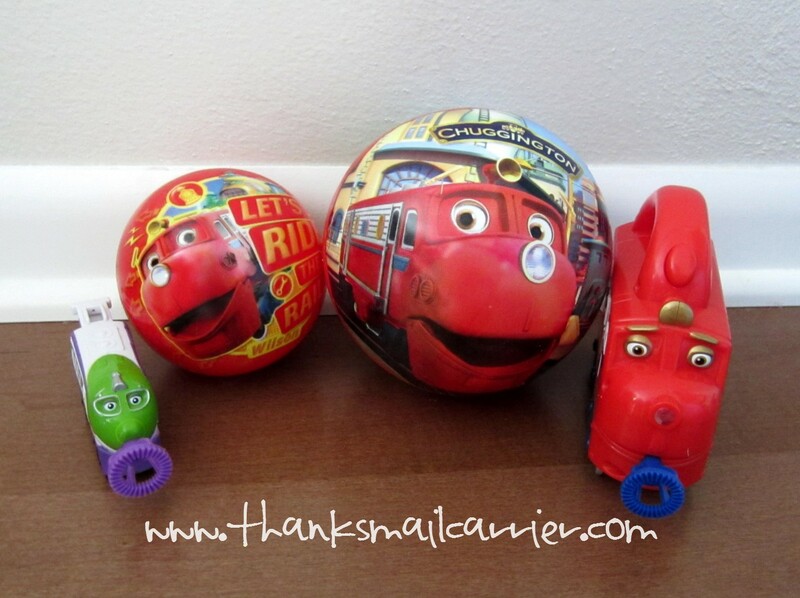 One lucky person will win a Bubble Train Whistle, Light Up Bubble Chugger and two Chuggington Vinyl Playballs! 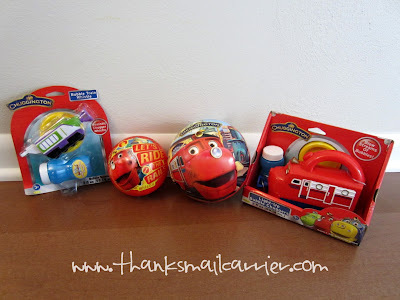 A big thank you to Chuggington for providing these four outdoor toys for me to review as well as for one lucky giveaway winner. The opinions shared are my own and honest and if you really need to see more, click here to see how I roll. My favorite outdoor toy when I was a child was my jump rope! My favorite was my baseball and mitt! 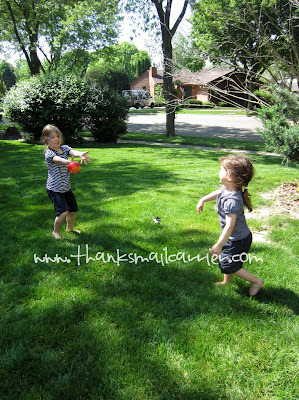 My brother and I would spend hours playing catch! Playing hopscotch on the driveway. so I guess chalk, lol. When I was a kid I loved my sandbox. I loved the slip n slide. I loved my bike and rode all over the neighborhood. My other toy was my real ponies. My favorite was the jumprope! My favorite was a paddling pool! I used to have a self propelled tractor that I used to ride on all the time. My favorite outdoor toy was my scooter! I had a lawn mower push toy that blew bubbles. Loved it! My favorite was my bicycle. When I was little my favorite outdoor toy would have been a tennis ball. I'd throw it up against the side of the house and try to catch it when it came back--like I was an infielder. I'd throw it a little bit further off to the side each time, making it a little harder on me. I loved to jump rope when I was young. My fave outdoor toy was my bike. My favorite outdoor toy in the summer was our slip n slide! 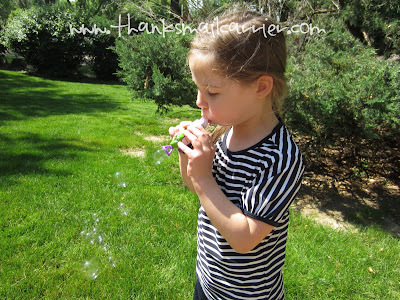 Bubbles, drawing with chalk and playing hopscotch. I loved the PogoStick when I was younger! I loved my Little tikes buggy car. My favorite toy was a jump rope. My favorite was the toy that attached to the sprinkler so we could play in it. I always loved hide and seek the best. My favorite game was Red Rover! I also loved bubbles. Jump Rope and Chalk ! I loved loved my bike. I was on it all the time riding! I used to love my Skip It! We had a merry-go-round type contraption that everyone could sit in and pump with their arms and make it spin-everyone still talks about it 25 yrs later. I liked throwing a frisbee. As a child my favorite outdoors toy was my red bike. My fave toy was a homemade cloth doll. I liked the slip 'n slide when I was a kid, as well as jumprope. skip it! I loved that thing. Depending on my age...my tricycle, dolls, stuffed animals, paper dolls, jacks, jump rope, table games. LOL You can now my age by this! Without a doubt... my beloved bicycle !! I loved my bike, my brother and I would go everywhere, sometime we would get lost and have to find our way back home. My favorite outdoor toy was my bike. I loved my bike and a sandbox...and an apple tree for climbing! My favorite out door toy was my hula hoop. I also liked my jump rope but the hoop was definitely my favorite. 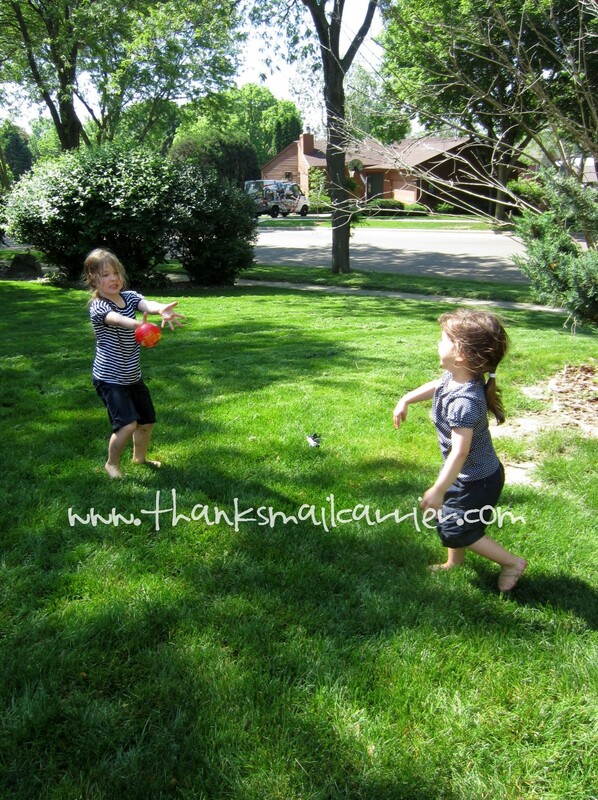 my favorite outdoor toy was a kickball when I was younger. When I was a kid I liked to jump rope. I loved to go to the park and play on swing and slides. I always loved playing Hide n Seek. my favorite outside toy when I was a kid was my outdoor swing set/jungle gym It had 2 swings, monkey bars, rigns and a slide. I loved the slipnslide ! I loved my skip it! I loved jump ropes and hula hoops! My favorite outdoor toy as a child was my bike. I loved playing on my swingset. I liked the swimming pool the best! Thanks for the giveaway. All I needed was nature. Well i am 43 so the toys are boring compared to what the kids have now, but i loved the hula hoop and the skip its remember the skip it toys! The hose was fun too when you did not have a pool! My fave outdoor toy as a child was my hoola hoop...I also loved the skip-it. My favorite outdoor toy when I was a child was my pail and shovel. Our swingset... but was that a toy? Maybe balls. I loved sports. My favorite outdoor toy was either skip-it or my bicycle. I didn't have an outdoor toy that i loved, but we used to do amazing scavenger hunts and obstacle courses when we were little!! Not sure if my comment went through. My favorite was my Big Wheel. I loved a Tire Swing we had! My purple and pink big wheel. I used to drag my barbies outside for fun in the sun! I loved my swingset and my hula hoop. We loved playing jumprope games! when I was a kid I envied my friends barbie car! but my favorite outdoor toy that I owned was badmitton. we had a huge yard and we played badmitton all the time. fun! My favorite toy was my bike. My swingset was my favorite outdoor toy (I guess you could consider it a toy). My favorite outdoor toy when I was a child was my roller stakes. Roller skating, bike riding, anything that would let me feel the wind in my hair! My bike and my roller skates. My pink huffy bike and slip and slides. I loved riding bikes with my brother. i use to love playing with a skip it use to see how long i could do it for.